Each scenario is self contained within the sealed card deck. When you open the game, you can unwrap the cards, but you are instructed to not look though the card deck (either side of the cards). Before you get started, you’ll have to download the free Unlock! app to run on your phone or tablet. The top card of each scenario that I’ve played so far has one side which lays out the rules and goals for the specific scenario, then it instructs you to flip over the card and start the timer on the app. Once started, you have 60 minutes to achieve the goal. Generally, the back of the first card is a location card. You’ll see a location with a bunch of circled numbers on it. You now flip through the deck, looking ONLY at the backs, and find cards with the matching numbers on the back. They are removed from the deck and placed face up on the table. Any time that you find a location card, you will then rifle thru the deck to find the matching cards. As you flip the cards over, you’ll find a couple of different card types that are helpfully color coded. There will be red and blue puzzle piece objects. These are objects that interact with other objects. In general, you will always be combining a red object with a blue object. 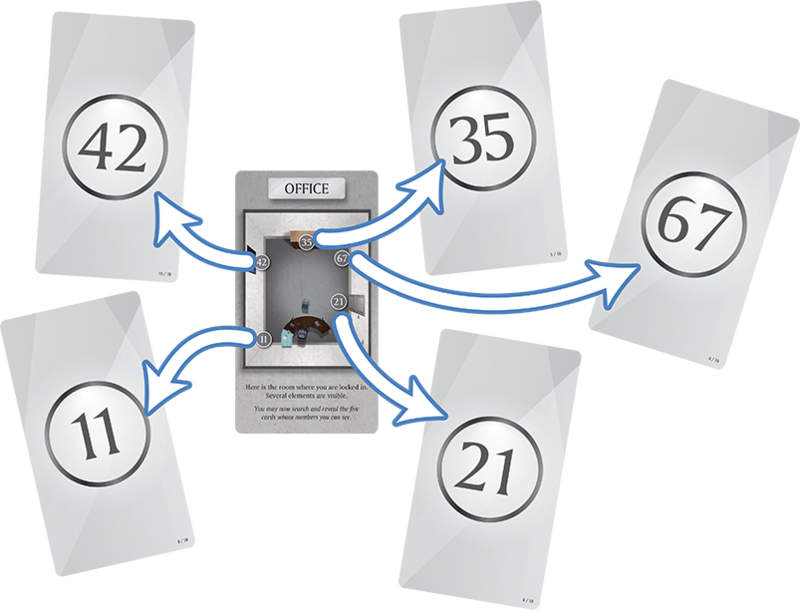 Often, you end up adding the numbers together – so if you take a piece of bread on card 12 and combine it with a toaster on card 45, you would look through the deck for card 57 (12+45) – and if this was the correct move, you’d find that card in the deck, and likely there would be a piece of toast on the back of it. If you had made an incorrect move, let’s say that you were really supposed to make a sandwich with the peanut butter on card 30… you might find a card 57 which would then have a penalty shown on the other side telling you that you didn’t do the correct thing. OR, you might not find card 45 at all in the deck – which tells you that you weren’t supposed to combine those two things together, but you don’t suffer a penalty for the error as you didn’t reveal it on a card. You will also find Yellow cards – these cards refer to codes. As you play the game, you’ll eventually figure out when you’ve generated a code. Whenever you get to that point, you go to the app, hit the “Code” button and input the code that you think that you’ve found. If you’re correct, the app will do something (tell you to find a specific card to reveal, tell you that you’ve won the game, etc). If you’re incorrect, the app will tell you that you are wrong. There are also Green Machine cards. These cards are never used directly with red or blue puzzle cards but they often provide modifiers to those numbers to help you find new cards to explore. Penalty cards come up when you make incorrect deductions. The penalty cards tell you how many times to hit the penalty button on the app, and each hit will take a few minutes off the clock. As you reveal new cards from the deck, you might see some numbers struck-through at the top of the new cards. When you see this, you can remove the struck thru numbers from play. Those cards can be returned to the box, you will not need them any longer. All other cards remain in play for you to examine and read until you are told to discard them. Do NOT get rid of any cards until you are specifically told to do so! As you play the game, you might find that you are stuck or not sure what you should be doing next. The app has a helpful hint system. You simply hit the Hint button on the app and then type in the card number that you’re stuck on – and the system will (hopefully) give you some help to get you on your way. The rules also make clear that there are hidden objects on the cards. There may be hidden numbers or letters disguised in the card art. If you think that you see a hidden number or letter, you then look thru the deck and see if you find a card with that number. If so, you reveal the card and add it to the table. That’s pretty much it. You have to get through the entire scenario within 60 minutes in order to “win” – though even if the time runs out, you can continue playing and using the app – you just won’t be able to score any points for your game. In general, I love this sort of game. We have tried just about every version of the puzzle/escape room game that we’ve been able to get our hands on, and in general, we have enjoyed this whole genre. Our blog has over 20 reviews now on games of this type. 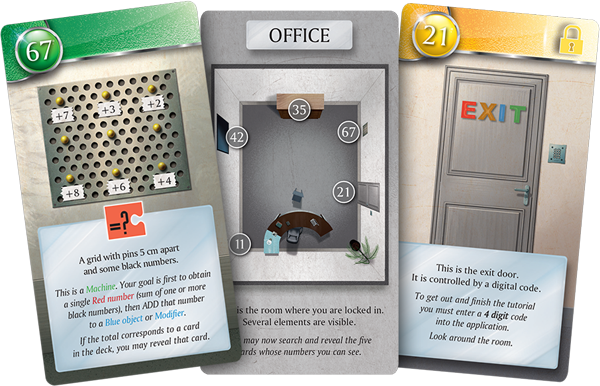 Each take on the escape room game has brought different puzzles and gimmicks to the table, and Unlock! is no exception. I have always liked the complexity of the puzzles seen in T.I.M.E Stories, and I feel that the Unlock! puzzles share that same level of trickiness. The games themselves are categorized from one to three locks in difficulty – and this can easily be seen on the box. The Exotic Adventures set gives you one game in each difficulty category. The game does require an app to play. It is fairly large (the Android app is over 150MB, so make sure that you’ve downloaded and installed it before game night). It does a good job in centralizing the clock and hint system. It also acts as an infallible judge as the app definitely tells you when you get a code right. If you want, the app can play some nice mood music which matches the scenario. While many of the others in my group liked the music, I found that it just made it difficult to hear conversations going on at the other end of the table – and with some of these puzzles, you never know when a random observation from another player will suddenly trigger you to solve something. The app has evolved over the years, and the hint system is a bit better than it used to be. One of my beefs with the original iteration of the game/app was that some of the hints were less than helpful… This has been fixed. Additionally, you can now auto-enable the automatic Hidden Object notification in the app – it’ll ask you this when you start a scenario. Your group will have to decide what to do about this. In one way, it will prevent you from getting stuck at a critical point – because the app will remind you (at approximately the right time into the game) that you should have noticed a hidden number by now. This way, you’ll not get stuck in a scenario because you haven’t found the hidden number disguised in the background art – which happens to be THE ONLY WAY that you can get a particular card that you need to progress in the story. There are a number of threads online at BGG for early modules complaining that those game are broken – because people couldn’t find the hidden numbers. You only get one chance to experience the scenario, and if you get into a roadblock – especially at a chokepoint in the scenario – it can lead to a very unfulfilling and unsatisfying experience. The game/app has also evolved so that machine cards now use the app. In the older games, you would use a machine, and then go digging for a card. However, it was possible to erroneously reveal a card based on a wrong calculation on a puzzle card. Now – the puzzles are all on the app, and you plug numbers into the machine screen on the app, and if you figure it out right, then it’ll tell you what to do next. This is a huge improvement because it eliminates possible innocent mistakes from adversely affecting the game. The puzzles in this set of games is good, and the difficulty level matches what is stated on the box. I think that this has been done well, and I commend Space Cowboys for getting that right. The evolution of the series has been a positive thing, and I’m happy to report that we did not find any typos either in the printed material nor the app. As far as the individual modules – I won’t give any spoilers… But some non-spoilery thoughts: The Night of the Boogeyman is the one-lock (easy) module in this set, and I think it would be appropriate for beginners to the series, but it would not be my recommendation for first overall – I would still lean towards The House on the Hill as my choice for very first Unlock! to play if everyone is new to the genre. There are a few twists that come up in the first episode that would be fiddly and frustrating to those who are still trying to wrap their heads around what they should be doing in the first place. I would also consider recommending the original “The Formula” as the first Unlock game to try so long as the app interface has been improved for it (i.e. the bad hints have been improved and the option for hidden numbers is available for that module). The other two (Scheherazade and Challenger) are probably best for adults. As I mentioned earlier, the evolution of the app and the integration of the technology into the game is a big plus. There were a number of inventive puzzles in this series which showed great ingenuity, and they were challenging to complete and pleasing to solve. I think there is a lot of room for innovation here, and this is one of the things which keeps me interested in this series. But, with all of these puzzle game series, I think you have to take the good with the bad. You can’t possibly know ahead of time (well… you shouldn’t know) due to spoiler issues, so you just have rely on the overall track record of the games. Here, there is more going on in favor of the Unlock games than against. Overall, I still very much like this series, especially because it is a non-destructive game. While I haven’t kept previous episodes in the series, choosing to trade them or gift them away, I plan to keep these three in the collection to use when folks who are new to these games want to try one. They are small in volume, loaded with fun, and they can be played over and over. Even if I really wouldn’t be able to play, I’d be happy to shepherd them thru the game and be in charge of the app – and I’m sure I’d still enjoy the chance to introduce others to this type of game which I have grown to love. For spoiler purposes, I cannot/will not rate individual scenarios, but I continue to LIKE the entire series and look forward to playing more of them. The occasional stumper puzzle and hidden number issue keeps me from LOVING it though.